Intelligence quotient tests are not required for visas to enter Russia temporarily, especially not if you are running another country. The last certified fool to be received by the Kremlin at the head of government level was Ronald Reagan. In retrospect, it is now clear that he was in an early stage of clinical brain damage. But in the case of British Prime Minister David Cameron, the symptoms appear to have been evidence when he was just 19 years of age. According to a speech Cameron gave to students at Moscow State University on Monday, “I first came to Russia as a student on my gap year between school and university in 1985. I took the Trans-Siberian Railway from Nakhodka to Moscow and went on to the Black Sea coast. There, two Russians – speaking perfect English – turned up on a beach mostly used by foreigners. They took me out to lunch and dinner and asked me about life in England and what I thought about politics. When I got back I told my tutor at university and he asked me whether it was an interview. If it was, it seems I didn’t get the job! My fortunes have improved a bit since then. So have those of Russia.” This story has been reported verbatim in every major London newspaper. Children the world over know what grownups mean when they are told never to talk to, accept gifts from or ride with strangers. Adolescent boys wearing tight-fitting bathing trunks on beaches are also advised to be wary when older men make approaches, especially if there are two of them. 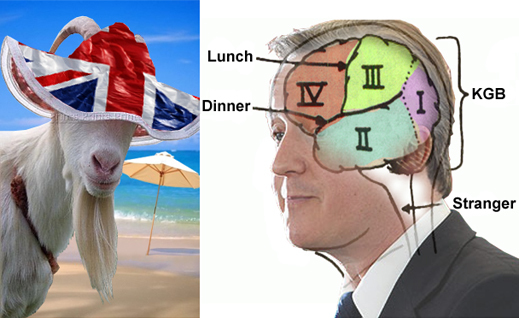 What then to make of what was going on in the young Etonian’s brain when his suntanning was interrupted by two perfectly fluent English speakers who invited him to a free lunch. Young Cameron apparently accepted their invitation, where the only thing he now reveals is what questions they asked him. Perhaps he was too preoccupied with talking about life’s pleasures in England to eat his fill, because he also accepted the strangers’ invitation to a free dinner. What exactly he did with the strangers between lunch and dinner the prime minister doesn’t say. Nor has he revealed whether the two men were blonde, blue-eyed, muscular, hirsute, tanned, well hung, or even how he knows they were Russian. A Murdoch newspaper has reported the additional details that one of the strangers spoke French (which may explain everything); and that for their second meal together, someone didn’t show up – it isn’t clear whether David stiffed his new acquaintances, or vice versa. Cameron evidently remembers a twinge of guilt because he reported what had befallen him to his tutor after he enrolled at Oxford. The Telegraph has reported that five years later Cameron also told his beach tale to the intelligence agency MI5 in 1990, when he was being vetted for a job as an advisor to a Treasury minister. Cameron’s MI5 file probably reveals that the agents asked penetrating questions about the physical characteristics of the two strangers, what was eaten for lunch and dinner, and of course what happened after lunch, later that afternoon, at dinner, and afterwards that night. The agents may have studied file satellite and agent photographs of the bushes, rockeries, public urinals, and other features of the scene on the Yalta esplanade, where Cameron’s story reportedly took place. Naturally, intelligence agencies the world over neither confirm nor deny what they are up to; and in 1985 hacking Cameron’s telephone wasn’t something Rupert Murdoch and his son were capable of, technologically. If you believe that the first-class honours pupil of Philosophy, Politics and Economics at Oxford took several weeks to “realise what had happened”, you too may flunk your next IQ test. But if you apply, you are bound to get your Russian tourist visa. And who knows – you may even be invited by well-spoken, handsome strangers to a free lunch and dinner. But if you accept twice, here’s the question Prime Minister Cameron has invited the student body at Moscow State to ask — how stupid can prime ministers of non-Russian countries be?